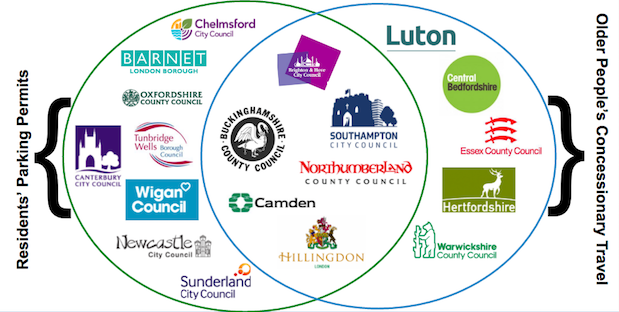 That's what Essex TV are excited about: "Leading technology partners are teaming up with Essex County Council to define how a digital strategy should be at the heart of a council to improve people’s lives, reshape public services and drive prosperity". A major event, to be held at the BT Tower on 27 February 2017. So you've missed it. So did DMossEsq. "The Smart Essex Digital Summit is by invitation only", and our invitation was lost in the post. The Government Digital Service (GDS) are working with 19 local authorities at the moment to show them how useful GOV.UK Verify (RIP) is. At least, that was the case, but now they're down to just 12. Which seven pulled out, and why? Essex isn't one of the 19 (☠ Correction, please see below). Or the 12. But they're committing to use GOV.UK Verify (RIP) anyway. That's what UKA local digital say. Is that right? They also tell us that "while Essex has not yet identified the initial use for Verify, [Stephen Canning, the council’s lead member for the programme,] believes it will be an effective platform for enabling people to authenticate their identities for using the council’s digital services" (emphasis added). That's not so much a commitment as a vague statement of intent. Also: "Essex plans to spend £2 million in working with BT on a sensor device to be mounted all the lampposts around the county. It has not yet targeted a specific purpose: [David Wilde ..., the council’s executive director for digital and chief information officer,] said that the device could be adapted over the long term to collect data on a wide range of factors, such as air quality, traffic movements and footfall" (emphasis added). Poorer local authorities may be surprised at this logical order – first choose the technology, then try to work out what to do with it. Essex, presumably, is as rich as Croesus and can afford to behave like this.